Put your compassion into action and get involved! At Animal Place, we have a number of ways for you to be active in the fight to end exploitation of other animals. Caring about the suffering of farmed animals is a great first step – take your compassion further and be a real ally to farmed animals! Start by educating yourself about how farming impacts the animals and why you want to see the suffering of nonhumans end. Once you learn the issues , you’ll be a knowledgeable activist! Our Food for Thought campaign asks animal shelters to align their behavior with their ethics by adopting an animal friendly menu policy for their fundraising events. Request a shelter packet and get involved by asking your shelter to adopt an animal friendly menu policy. Tell them about our grant! 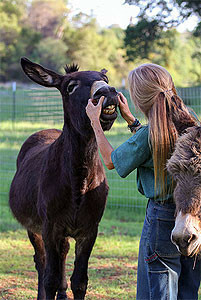 Animal Place offers two unique opportunities to work alongside like-minded humans and with the rescued animals at the sanctuary. Join our volunteer team and help with animal care, tabling, events, and socializing…on YOUR time! Or, apply for a residential internship position in animal care or outreach and get the inside scoop on what it’s like to work for a farmed animal sanctuary. Develop your skills and become a better activist. Change the world…one recipe at a time! Join our weekly recipe list and receive a vegan breakfast, lunch, dinner, and dessert every Monday in your inbox. Being kind never tasted so good! Check out the job opportunities available at Animal Place and join our team of dedicated activists.